It's fair to say that someone with no real exposure to our fishkeeping hobby has a perception of a typical aquarium as a gentle, peaceful place where little fish gracefully flit around and idle the days away in a miniature aquatic heaven. It is certainly possible to set up a tank that gives this illusion; a couple of angelfish, a few shimmering tetras and so on. Very nice indeed; unless of course you're a speed freak like this month's featured catfish. Speed freak is at first an odd phrase to use for a fish that spends most of its time clinging to rocks, but the various species of Chaetostoma personally give me the impression of a motorcycle rider clinging for dear life on their beloved bike as the world hurtles past on all sides. Such is the life of most species of Chaetostoma. Home is usually a rounded rock only just submerged in a cool clear water tropical stream that never ceases rushing past. So much for our vision of aquatic heaven. Keeping fast water suckermouths is a challenge, but one that can be surprisingly rewarding to meet, like our fast water friends, head on. The initial practical hurdle of setting up a tank for these fast water fish is simply how to produce an adequate current. At first though the idea of setting up a couple of power driven filters at one end of the tank appears the best idea. But this has some failings, the main one being that most of the food offered to the fish is very quickly filtered out rather than allowed to get anywhere near the bottom dwelling fish. This method also makes it hard to control the water current and ensure some areas are available for the fish to feed in. There are two approaches to solving the problem and I have shown one below and will discuss both. In the first, a powerful filter pushes water in a hose along the length of an oblong tank to a spray bar placed on the opposing tank wall. A tall tank is not necessary, the one below is 12" high. The longer the tank the better, but more than one filter may be required for anything longer than about 3 feet. The spray bar returns water to the tank at an adjustable angle. This angle is important and it allows the aquarist to vary the current to suit. 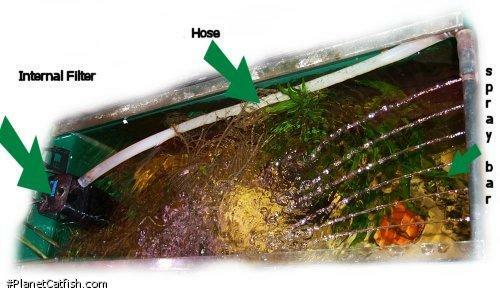 If the angle between the returned water stream and the aquarium wall is too acute, current will be localized at that end of the tank and food will generally be pushed to the other end where it is filtered out. Ideally a more obtuse angle is required that creates a fast current towards the filter intake but the area immediately under the spray bar has relatively little current in it and tends to collect both waste, loose debris and food. The fish learn to eat here over time and it makes maintenance easier too. The other method follows the same idea, but the water is pulled rather than pushed. A powerhead is utilized to draw water from a sponge based filter that is positioned at the other end of the tank (again oblong tanks are required). This produces a stronger water flow, but additional air stones are required to keep dissolved oxygen levels up. This second method has the advantage of being quieter and doesn't require the tight fitting lid the the first requires. This is because the spray bar approach makes a lot of noise from the water being returned to the tank and the pressure at which it is returned from the spray bar is such that much of it gets splashed around. Now that the water current is right, our thoughts turn to aquarium decoration. Chaetostoma will live on wood if nothing else is available, but they do prefer smooth stone. I have experimented with a bare tank containing Chaetostoma spp. and added a single, but large, piece of bogwood. The dominant fish take up position on the glass underneath the wood, but the wood itself is left for others. So, fist size and larger pebbles are required as opposed to wood. You can use a little sandy substrate to stop the stones moving around too; this tends to drift and pile up in some areas while leaving other areas bare; but again this appears to suit the plecos who often excavate small dwellings for themselves in the sand under flat stones. The final act of design is feeding. Chaetostoma eat algae to the point where they can clean out a very green tank in record time, but this is only half the story. Much of their diet is made up of the tiny organisms living in the algae and the small insect larvae that can be found crawling around the stones. A feeding ground is required and this area should allow the fish to approach food that is lying still and not being pushed around by the current. The best way to locate this is to set up your tank, put in the rocks and switch on the filters and drop in some finely chopped vegetable matter. Spinach is good, but pretty much anything will do. Go away and come back half an hour later. If the spinach has been filtered out or is still swirling around near the filter then you have to rethink your water currents, there isn't a suitably sized area of low current. What you want to happen is to see the spinach all collected in a small pile in one area of the tank away from the filter - when you feed the tank this will be where the food collects for the fish to feast on. There are several species of Chaetostoma that make their way into the trade, some frequently, but all are fast water fish and most prefer cooler water. The different types have various common names but tend to be called either bulldog or rubber plecos. Bulldog because of the fishes stoic and often defensive looking posture and rubber pleco due to the fact that when the fish is feeding the whole snout of the fish gives the appearance of being fashioned from rubber. 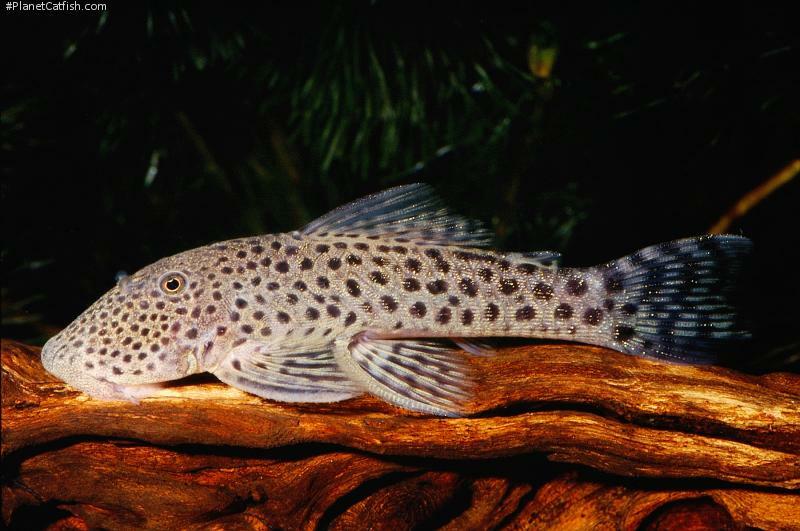 The names hillstream, mountain or brook pleco are also - but infrequently - used to describe the genus. The fish pictured here is shown in Aqualog as L187a and is totally different from the white speckled L187. It is a fairly large Chaetostoma and can reach lengths of about 12cm. Aqualog also present L146, L146a and L148 as species of Chaetostoma, but in the "original" DATZ articles these are Sophiancistrus ucayalensis and a fairly nondescript species of Ancistrus from Puerto Ayacucho, Venezuela respectively. The original DATZ series of L-numbers has four species of Chaetostoma. These are L187, L188 and L225 and L277 although different in colour and pattern, they are all the same instantly recognizable shape and care for all these animals is roughly the same as outlined here. The reason I write "original" as such within quotes is, because of an editorial error, the L-numbers L146, 147 and 148 were allocated twice, the first time to 3 species of Chaetostoma and the second time to the fish described previously! This has been corrected laterly and the "original" allocations (i.e. Sophiancistrus etc. stand). This fish pictured here is shown in Aqualog as the "unofficial" l-number L187a and is totally different from the white speckled L187. As this is a frequent import, eventually the species was assigned an official number. Often labelled incorrectly as C. milesi. L445 is exported from Colombia and has smaller spots on the head than on the body typically with greater spacing between the spots on the head. Sexing The males have a somewhat larger and broader head, slimmer ventral sides and disproportionately large pelvic fins. Perhaps the over-sized pelvic fins play a large role in the fertilization of the eggs. By inverting these over the clutch of eggs, they prevent the sperm cells being carried away too fast in the current. Distribution Collected from tributaties of the Rio meta, in the area around Villavicencio, Colombia. Other Parameters Has more stringent demands on water quality than many plecos and requires highly oxygenated water. Medium hard water is also beneficial. Feeding Omnivore. Will eat algae and small live or frozen food. Some individuals can be weaned onto pellet food although this usually takes some effort and trial and error on the part of the aquarist. Furniture Worn smooth rounded or slightly flat fist sized rocks on a fine sand substrate. Compatibility A peaceful fish which can sometimes be a little territorial with its own species. Suggested Tankmates Certain fast water fish would fit in with the requirements of this fish. Many of the other fast water Loricariids can be kept with this fish. Often found in the wild with smaller pike cichlid species and fast water silvery characins. Breeding Not reported in the aquarium although other species of Chaetostoma have reproduced in captivity.